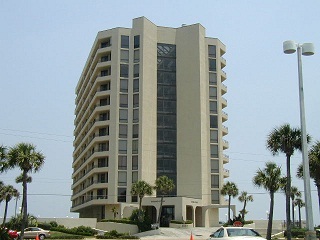 Oceans Atrium Condominium consists of 12 floors and 78 units and is located in Daytona Beach Shores. The complex greets you with an impressive lobby open from floor to ceiling with a beautiful water fountain and waterfall. Ride the large glass elevator and see the indoor heated pool and views of the Atlantic Ocean. This condominium is perfect for full time residents or a vacation home! Are you looking for a condo that is in walking distance to practically everything? Golf course, Publix Grocery, banks, restaurants, community center, fire department and police department to name a few near by necessities. Oceans Atrium is one of the few condominiums in the area that allow a 1 month rental period. The association also allows 2 Small pets under 25 lbs.